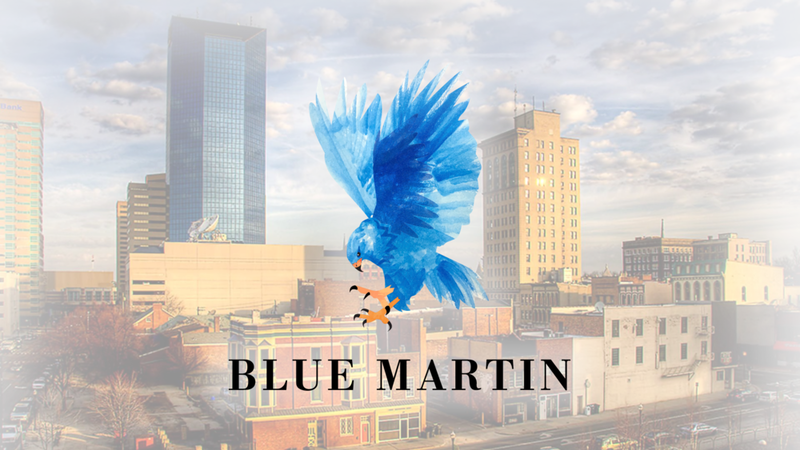 Blue Martin is a consulting agency located in Lexington KY that commercializes early stage ventures, takes growing enterprises to the next level, and offers strategic planning. Vicki Martin, the founder and Managing Principle, combined the regional love for the University of Kentucky Wildcats and her last name Martin to create an interesting juxtaposition of name and imagery. She knew that she wanted a hawk symbol, representing the birds soaring patience and then swift, focused and decisive action in the wild, however she wasn't quite sure how to implement it. After exploring traditional minimalist marks for Blue Martin, we decided to go a different direction. They wanted some texture and energy flowing throughout the bird, to give it some pop and luster. We settled on a water color texture that I have implemented in design before. After painting and scanning many textures, I was able to create the desired effect.